Hazard ratio estimates for mortality risk for women whose telomeres shortened between measurements taken at averages of 6 months (baseline) and 30 months (follow-up) after breast cancer diagnosis, compared to women whose telomeres lengthened. Upper confidence limits are truncated at 5 in this figure. Telomeres are repetitive sequences of DNA that form at the ends of chromosomes. Much like the plastic caps at the ends of shoelaces, telomeres protect the ends of chromosomes from damage and degradation. Short telomeres are generally associated with increased cancer risk, but less is known about how telomere length impacts cancer mortality. In a recent study published in the Journal of the National Cancer Institute, Drs. 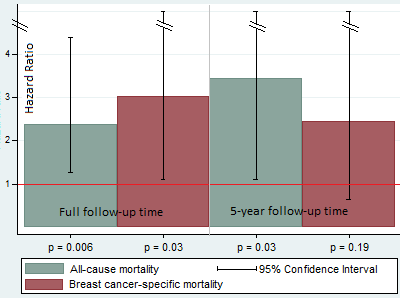 Catherine Duggan, Anne McTiernan, and colleagues in the Public Health Sciences Division investigated whether changes in telomere length over time impacted mortality among breast cancer survivors. Results showed that telomere shortening was associated with increased risk of both overall and breast cancer-specific mortality, raising the possibility that change in telomere length might be a biomarker for cancer prognosis. To investigate this question, the authors measured leukocyte telomere length in roughly 500 participants of the Health Eating Activity and Lifestyle (HEAL) study, a multiethnic cohort of breast cancer survivors from Washington State, Los Angeles, and New Mexico. Telomere lengths were measured twice, at averages of 6 months (baseline) and 30 months (follow-up) after diagnosis. Between these time points, roughly two-thirds of participants had telomeres that shortened, while telomeres in the remaining third lengthened over time. After an average of 11.2 years of follow-up, neither baseline nor follow-up telomere length were associated with mortality. When the authors evaluated the change in telomere length over time, however, they found that participants whose telomeres shortened between the two measurements had statistically significantly worse outcomes. Compared to women whose telomeres lengthened, women whose telomeres shortened had both higher breast cancer-specific (hazard ratio = 3.03) and all-cause mortality (hazard ratio = 2.38, see figure). "This tells us that change in telomere length over time might be more important than the absolute level," said senior author McTiernan. Such longitudinal changes may reflect secondary characteristics that affect telomere attrition rate or other important factors in specific individuals. The authors also evaluated whether 5-year survival rates were impacted by telomere length. When follow-up was censored at 5 years, both baseline and follow-up telomere length showed a significant association with all-cause but not breast cancer-specific mortality. For both measurements, longer telomeres were associated with reduced mortality. Shortening telomeres were again associated with higher mortality, but this relationship was now only statistically significant for all-cause mortality. This may suggest that long-term mortality risk might be modifiable, as risk may not be related to baseline length but rate of change over time. Measuring changes in blood telomere length over time could also be useful as a potential biomarker of cancer prognosis, and interventions that impact this change could be beneficial. "Given that change was important," said McTiernan, "we need to find ways to reduce shortening of telomere length over time." One potential opportunity for intervention could be reducing stress in cancer survivors. In this study, participants with higher levels of stress had shorter telomeres at both baseline and follow-up measurements, "which highlights the importance of stress reduction in cancer survivors," said lead author Duggan. This study is the first to link telomere shortening with poorer prognosis in breast cancer survivors, though the biological basis for the associations between telomere shortening and poorer outcomes is not yet well understood. "Additional research is also needed to investigate how telomere length in tumor cells correlate with those in peripheral blood cells," said Duggan. Given the current findings, additional research is certainly warranted, and the authors are looking forward to building on these findings. For example, said McTiernan, "it would be very interesting to test whether an intervention to reduce perceived psychological stress could prevent telomere shortening, or even increase telomere length." Other PHS investigators contributing to this project were Drs. Ikyuo Imayama, Sarah Holt, and Peter Rabinovitch. Duggan C, Risques R, Alfano C, Prunkard D, Imayama I, Holte S, Baumgartner K, Baumgartner R, Bernstein L, Ballard-Barbash R, Rabinovitch P, McTiernan A. 2014. Change in peripheral blood leukocyte telomere length and mortality in breast cancer survivors. J Natl Cancer Inst. 106(4):dju035.